Located in Paiporta, Valencia (Spain), Indutec Solid was established in 1995 as a company specialised in machining for the wood sector. From its beginnings it had a powerful engineering team which allowed its clients to carry out all kinds of projects. This is why PORCELANOSA Group, particularly Butech and KRION®, have required its services for emblematic projects such as the “Pole Optique ventilated facade”, the “Parvulario Olyme de Gouges ventilated facade”, and a “family home in Mongolia”, among many other examples. Today, however, we are going to focus on the impressive “Centralcon Building Shopping Mall, Shenzhen (China)” project. 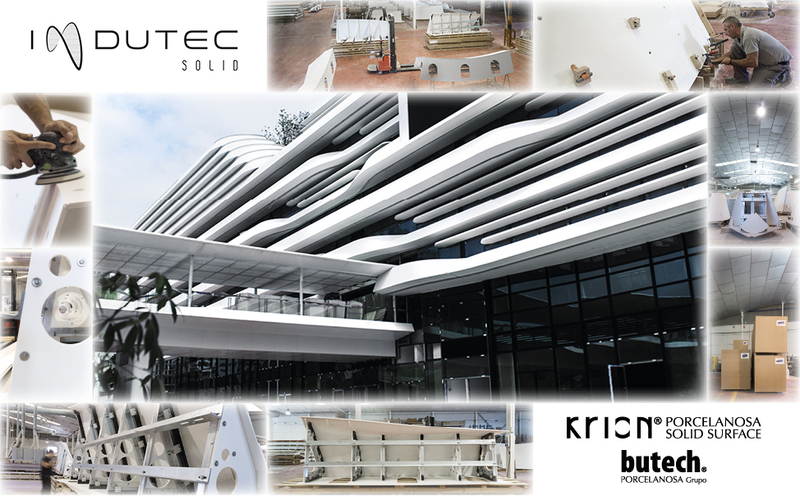 Currently, the activity of Indutec Solidis mainly focused on the transformation of the Solid Surface KRION®. Its purpose is to transform ideas into logical, efficient engineering processes at the lowest cost possible. All of this is thanks to the combination of the possibilities of our material KRION®, and the experience of its technical office, not to mention its facilities and infrastructure (machining centres in 5 locations, thermoforming furnace, membrane press, etc.). Centralcon Building Shopping Mall, Shenzhen (China). “One of the great challenges for Indutec has been collaboration in the construction of the ventilated facade of the Centralcon Shenzhen project; the manufacture of the “twisters”, the development of its geometry, the structural definition of its attachment, as in their development the deformation of thermoforming in the final process had to be taken into account, splitting the flat sheets of KRION®. It was a very complex project on which Indutec worked from the beginning of 2014 until November 2015. Over 1,000 elements were manufactured, over 100 containers sent, and there was great satisfaction in being part of this great project along with PORCELANOSA Group”.